MarksNelson employees and its community partners spread holiday cheer at locations across Kansas City one scarf at a time. On December 21st, which is the first day of winter, thousands of hats, scarves and gloves were tied around trees and light poles, stuffed in fences and placed on benches and bushes. It's part of the firm's Wrapped in Warmth program which provides winter essentials to Kansas City's homeless as well as those in need. 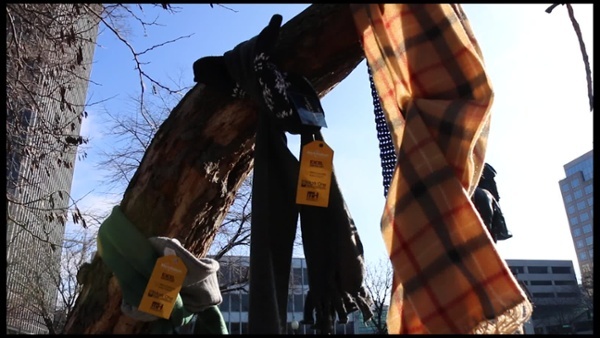 MarksNelson launched “Wrapped in Warmth” after participating in a coat drive and realized there was a need for warm winter accessories to stave off the cold. It's become an event which the staff members look forward to every year. "It's one of my favorite days at the firm", said Marketing and PR Specialist Kim Woirhaye-Reid. "Our employees get involved even taking their children on shopping trips looking for the perfect items to donate." Last year, MarksNelson employees formed a knitting group which would meet over the lunch hour. They were responsible for nearly 150 handmade items handed out to the homeless. Members contributed around the same amount in 2018. The program is also catching the attention of the public who donated handmade items as well. Schools and Girl Scout Troops made no-sew flannel scarves, and more than 300 items were made by knitters across the metro. One gentleman dropped off 120 hats he had worked on all year. Kent Robinson said after seeing a story about Wrapped in Warmth in the news he knew he wanted to participate. Three Trails West DAR Chapter also held a collection drive. This year MarksNelson and its community partners including, Excel Constructors, DeVry, Mark One Electric, Musselman & Hall collected over 2,500 items some of which were given to Kansas City Nonprofits who serve the homeless ahead of time due to the early snowfall in Kansas City. The remaining items were distributed at seven locations across Kansas City on December 21st, including Illus Davis Park, Case Park, Mill Creek Park near the Plaza, the West Bottoms, Huron Park in KCK, the Kansas City Public Library downtown and Washington Square Park at Pershing and Grand. This is the third year for Wrapped in Warmth which is part of MarksNelson's award-winning Marks of Kindness program designed to focus on making a positive impact in the community. Want to get involved? Contact us to learn how you can participate in collecting or knitting hats, scarves and gloves. Or you can give a financial gift to our foundation which supports Kansas City Nonprofits serving the homeless.